Spring officially started in late March, but with rainstorms and cold spells making weather unpredictable, it's been hard to get excited about spring cleaning. Now, though, warm weather seems to be settling in for good, and with yard-sale season just around the corner, it's the perfect time to clear out those cluttered closets and basements, organize those overflowing kitchen drawers and maybe even tackle the attic and basement. After all, you never know what you might find. When it comes to spring cleaning, fighting the mess is only half the battle; the other half of the struggle lies in overcoming sentimental attachment to possessions that are outgrown, old, broken or otherwise no longer useful. With that in mind, here are some tips for taking control of your mess -- and your feelings about it -- and putting a few bucks back in your pocket while doing so. While most of us will (hopefully) never end up on Hoarders or Buried Alive, we all have possessions that collect dust and areas that fill with clutter. The first step in clearing out your clutter lies in finding the items you no longer really need... and the first step in finding these items lies in finding your dust. If you have things in your house that look like hand me downs from the Addams Family, chances are that they are high on the list for clutter removal. Admittedly, some of these -- like the keepsakes in your attic or the tchotchkes lined up on your mantel -- may be hard to let go. Then again, it's worth asking yourself if you want to spend your time -- and fill up the space in your home -- with possessions that you never touch. It's easy to fall into the trap of believing that possessions don't come with a cost. After all, once you've paid for a winter coat or food processor or television, that's that, right? Well, maybe not. If you're paying for a storage area, there's a monthly cost associated with your possessions -- and it's worthwhile to ask yourself if you really want to pay money to store clothes that you don't wear, books that you don't read, or pictures that you don't look at. But even if you aren't renting a storage space, there are still costs associated with your possessions. If you have a crowded garage, carport or little room under the stairs, that's space that you're renting or paying a mortgage on, but aren't able to use. When you need a little more inspiration, think about what you could do with the extra space -- or even where you could live if you didn't have to pay for rooms that you don't use! What would you do with an extra hundred dollars? What about an extra thousand? While you're thinking about that, you might also consider how much money you could get for the unworn clothes, old jewelry, unused appliances, and other things that clutter up your basement and closets. Just for fun, try this: Make a list of everything that you could conceivably get rid of. Afterward, go to Craigslist, eBay, Etsy, and the local pawn shop to see what similar possessions are selling for. Once you've got an idea of how much money you stand to make, think about what you might do with that cash. Is it enough for a road trip? A cruise? A down payment on a new car? Now ask yourself: would I rather hold onto Grandma's old mink coat or take a slow boat to Bermuda? Clearing out your clutter is a thankless task. Even under the best of circumstances, you're going to spend a lot of time putting things in trash bags, listing them on eBay or driving them to Goodwill. At worst, you're going to spend a lot of time doing all that, plus trying to talk yourself into getting rid of possessions that you feel attached to. This can drag on for weeks, or even months, and it's easy to lose track of the progress that you're undoubtedly making. One way of to keep track of your progress and reward your dedication is by setting up a fund. Whether a special PayPal account, a separate savings account, or just a big plastic water jug that you fill with small bills, it's helpful to have a place where you can watch your money grow...while your clutter shrinks! Rome wasn't built in a day -- and chances are that the clutter left over from the construction wasn't cleaned up in a week. Rather than focusing on everything that you need to do and every space that you need to clean, set yourself achievable goals. 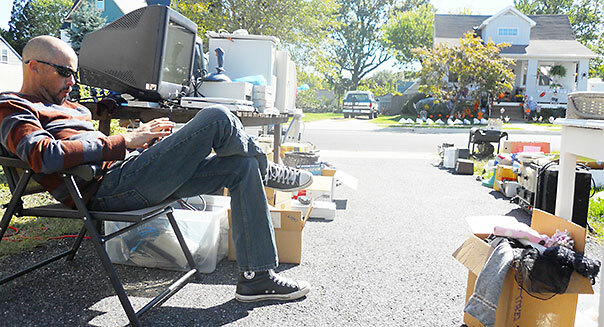 For example, instead of worrying about everything in the attic that needs to be cleared away, try taking an afternoon to set aside all the items that could be sold in a yard sale. Ultimately, clearing out your clutter is a marathon, not a dash. Instead of trying to do it all at once, set aside a few hours every week -- Sunday afternoons, perhaps, or Saturday mornings -- to chip away at the mess. When it's time to get to work, go to work...and when it's time to stop, be sure to stop! Not only will this help keep you from getting overwhelmed, but it will give you a perfect excuse to give yourself a treat in return for your hard work.